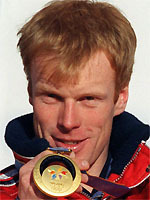 Only a recurring back injury prevented the great cross-country racer Bjorn Dahlie from extending his all-time Olympic gold medal record at the Salt Lake City Games in 2002. In spite of this disappointment the Norwegian, who won 12 Olympic medals - and a record eight golds - during the 1990's and became a hero in his country, is still considered by many as the very finest cross-country competitor of all time. 'Rocketman', as he became known, came to the sport comparatively late after trying out other Nordic disciplines like ski-jumping and the Nordic combined. He became a professional in 1987, finishing a modest 27th in his first race at Holmenkollen in Norway. Ironically, over an eleven-year career Dahlie never won at Holmenkollen, home of cross-country skiing. His first taste of success came at a World Cup event in Salt Lake City on December 9, 1989 in the 15km classical race. By the 1992 Games at Albertville the Norwegian was at the peak of his form and he swept to three gold medals in the 15km combined, the 50km freestyle and the relay. After that success he only had to wait two years before the next Games at Lillehammer in 1994 for another chance to slake his thirst for medals. In the end he did not have things all his own way. He was beaten fairly and squarely in the 30km freestyle by compatriot Thomas Alsgaard, and although comfortably winning the 10km classical and the 15km combined, a nasty surprise was awaiting him in the relay. The Norwegian team was pushed all the way by the tenacious Italians and the race went right to the wire, with Dahlie and Silvio Fauner neck-and-neck in the final stretch. Fauner won by the narrowest of margins and Dahlie's medal haul in the end looked disappointing by his standards. Within 12 months, though, he had recovered his confidence again and he won the overall World Cup title in 1995, 1996, and 1997. At Nagano in 1998, he won a further three gold medals, including the 50km freestyle on the final day of the Games. Dahlie had a real chance of setting what would have been a record 10 career gold medals at the Salt Lake Games in 2002 and bettering the previous mark of nine then held by Mark Spitz, Carl Lewis, Larissa Latinina and Paavo Nurmi. But it was not to be, due to medical reasons he reluctantly retired from the sport at a competitive level on March 29, 2001 and of course Michael Phelps has since come along and smashed every record in the books with his 14 career golds as of Beijing in 2008.